“Antisense” is a story of scientific discovery and intrigue, including the human interactions that accompany this potentially significant anti-AIDS and anti-cancer project. Technically “Antisense” refers to the non-coding strand of DNA, but more specifically it denotes the use of small pieces of DNA or oligo-nucleotides used as “genetic drugs.” The protagonist faces unexpected opposition in carrying out his research project from one of his students who connives with his boss to take over the project. The action describes how these interactions develop and how the scientific aspects of the project are continued despite such difficult personal situations. The action takes place at the National Institutes of Health (NIH) the largest biomedical research center in the world and provides a glimpse into the struggles for turf and advantage in the scientific world. The story includes a visit to the research center of the former Soviet Union at Academgorodok, as well as an encounter with the CIA. 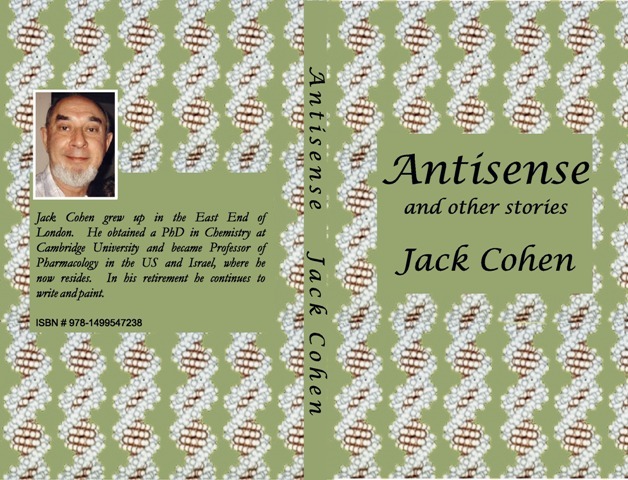 In addition four other stories are included: “Ulpan,” a story of murder in an intensive Hebrew language school; “The Perfect Spy,” a Jewish boy who goes to England to have plastic surgery in the 1930s and becomes the perfect spy in Hitler’s headquarters; “Jutland,” a voyage of discovery by an American actor into his mother’s devastating past; “Meningioma,” how a benign growth on the optic nerve and its removal can change a person’s vision and life. Finally, the book includes short biographies of fourteen “Lesser known heroes of Jewish history,” including some that most people have never heard of, yet who did amazing and sometimes daring and historic actions. To order copies of "Antisense" go to Amazon.com at "http://www.amazon.com/dp/B00KXMIIPO"